You are not allowed to enter the venue through other entrances than stated on your ticket. No worries if that means you and your friends need to enter via separate entrances: once you’re inside, you can meet up and party together until the sunrise. Make sure to bring your ID and ticket to the event. The minimum age for the event is 18+. We cannot grant access to visitors younger than 18. Therefore, it is important to take legal identification with you for security to check your age. Tickets for ASOT900 Utrecht do not need to be personalized: it does not matter if all tickets from your order are on the same name. If you buy a ticket from someone else, you do not need to change the name on the ticket. Since every sold (E)-ticket needs to be scanned at the enterance, please bring a printed version of it with you. Access will only be granted with a valid, printed e-ticket. Confirmation e-mails or anything else do not function as an enterance ticket. Want to have all the handy-dandy information in one place? 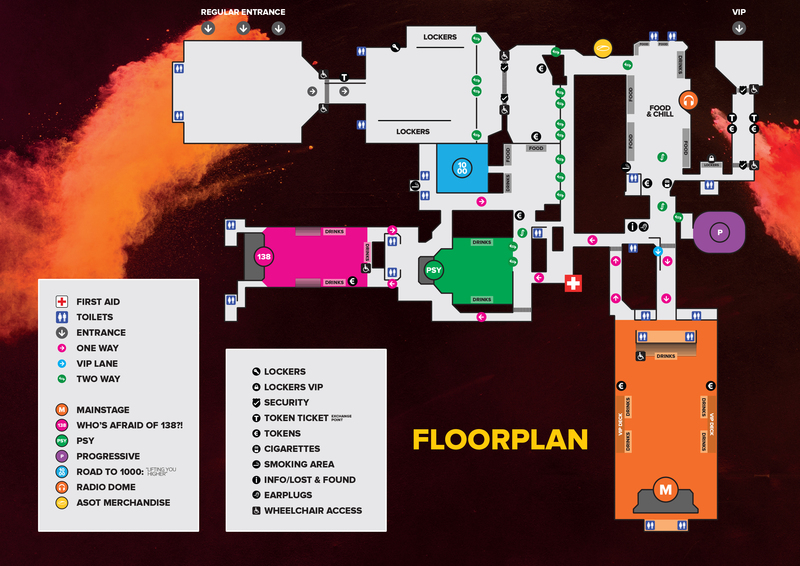 Get the Woov app now, where you’ll find all ASOT info right under your thumb: woov.com/ASOT900 This app includes the floorplan, chatfunction and you can create your own timetable! At ASOT900 Utrecht we work with e-lockers: You pay no deposit and there’s no key to pick up! Get your e-locker in advance and get a discount! E-locker tickets can be bought in the online ticket shop until 12PM on the 22nd of February.At the festival site you can open and close your locker with the code provided at one of the lockerdesks by showing your Paylogic ticket. E-lockers can also be purchased at the venue. During ASOT900 Utrecht you can pay for food and drinks with tokens. You can easily and quickly buy these tokens with your debit card and cash at the different token points. Want to avoid the queues for the tokens? Buy your Token Ticket in advance! A Token Ticket is worth 10,5 tokens, which you can easily pick up at the event – without standing in line for the cashiers too long. Token tickets can be bought in the online ticket shop until 12PM on the 22nd of February. During the event the token tickets can be exchanged at the token lanes by the Regular and VIP entrance. If you are travelling by car, please follow the blue ANWB signs that read ‘Jaarbeurs’ from the Utrecht Ring Road. Jaarbeurs has ample parking space on its own grounds in the centre of Utrecht. Parking fee 18 euros for each car. For current information on the accessibility of the Utrecht city centre and any roadworks in the area, please visit www.goedopweg.nl. The Jaarbeurs is positioned next to Utrecht Central Station and therefore has a great accessibility by train. From Utrecht Central Station, follow the signs that read ‘Jaarbeursplein’. It is a five-minute walk to the Beatrix Building or the venue of the Jaarbeurs. From 6AM there will be several extra trains scheduled. Plan your public transport trip here. We enforce a strict zero-tolerance policy. There are plenty of toilets located throughout the Jaarbeurs. All toilets can be used free of charge. Various types of food and drinks are available from one of the many vendors throughout the venue. It’s not allowed to bring your own food or drinks. Like every year at ASOT it is possible to buy a custom ASOT water bottle, which you can fill with free water during the event. 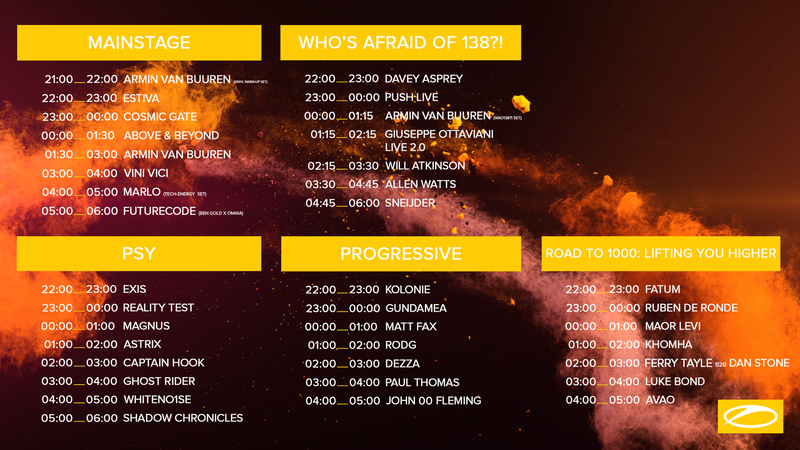 Find them near the Mainstage and Who’s Afraid of 138?! Area! Already bought an ASOT water bottle at one of the previous editions? As long as it’s empty, you can bring your ASOT water bottle along! As a standard procedure, all visitors and crew are thoroughly inspected. Visitors are not allowed to bring luggage and/or backpacks to the event. You are allowed to bring handbags with a maximum size of A4 and 10cm thickness. The safety of our visitors is always a high priority. In regard to recent developments worldwide, we are extra cautious with all procedures. We ask for your understanding in this. Bringing professional or semi-professional photographic equipment to this event is prohibited, unless agreed upon otherwise by means of an assigned press accreditation. Selfie sticks longer than 1 meter are prohibited as well. Normal digital or other cameras and GoPro camers are permitted. Smoking is only allowed at the designated smoking areas located within the Jaarbeurs. Please be aware of your valuable belongings and keep an eye out for pickpockets. We hope you practiced your dance moves because ASOT900 is going live! Any friends who couldn’t join you to the the biggest party of the year? Let them know they can watch you dance along the world’s biggest DJs via ASOT.TV. Challenge them to snap a screenshot when they see you live on screen!